Helletun Catering use our WooCommerce Product Table plugin for their online food ordering system. They use it to sell international tapas dishes in a user-friendly WooCommerce order form. The dishes are listed in multiple tables, each listing a different section from the tapas menu. 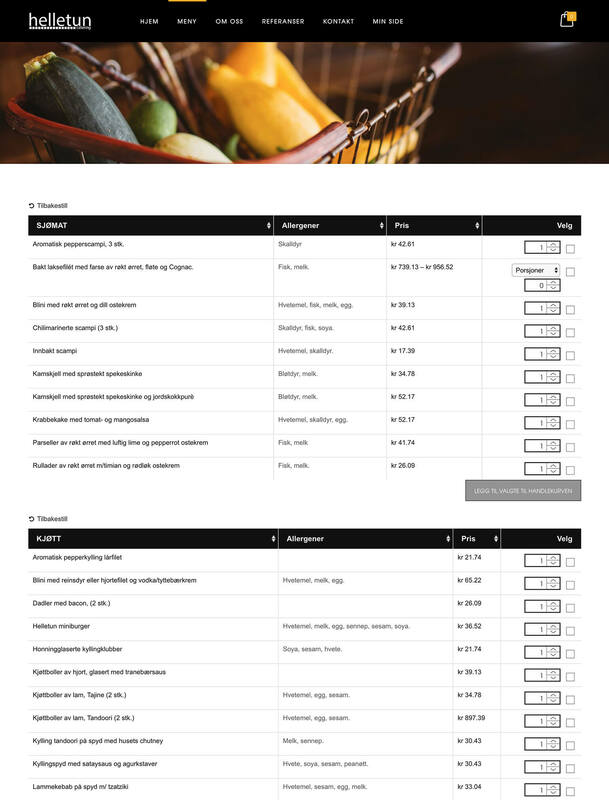 There are separate columns for the food names, list of allergens, price, and add to cart column with quantity picker. The WooCommerce catering website uses the ‘checkbox’ add to cart option, which has multi-select tick boxes – a great way to encourage customers to place a bigger order. There are some variable products in the table, where customers can select an option for the number of portions before adding to the cart. The list of tapas dishes have been kept intentionally simple, hiding unnecessary elements such as the search box. This draws attention to the foods , with no distractions. The product tables have been integrated nicely into the overall design of the page, with helpful navigation links and stunning images of the foods to whet your appetite. Everything about this WooCommerce catering ordering system has been carefully crafted for ease of use and to maximize conversions. Read our tutorial and learn how to do the same for your restaurant ordering system. Use WooCommerce Product Table to create a successful WooCommerce catering or online restaurant ordering system.